Translation software can translate foreign language documents instantly! 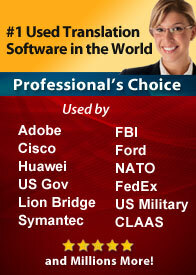 Systran has the highest accuracy available in automatic language conversion software. Developing machine translation software is a difficult task. Systran's patented technology employs an artificial intelligence that analyzes sentence structure, grammar and punctuation to deliver only the highest quality. If a document is properly written before translation, it will deliver higher accuracy once translated. 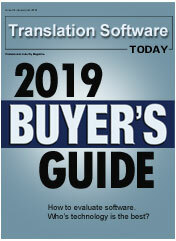 If you are looking for the best translation software, you have found it at Systran! Higher Accuracy! Professional has all the features of our Essentials Translator plus access to even more advanced tools and dictionaries that can increase accuracy and provide a more efficient work flow. Includes tools that automatically learn and build terminology and phrase dictionaries. Create your own custom dictionaries to control the translations even more. This version includes 21 additional industry specific dictionaries with millions of terms. Check out the additional dictionaries for industries such as finance, aviation, automotive, physics, food services, computers, medical, engineering and more. Award-winning SYSTRAN Enterprise software will help your business bridge the language gap and succeed globally! This powerful solution is able to meet the full range of translation needs on an enterprise scale. Enjoy the New Pure Neural Translation Engine that delivers translations so accurate, they are close to human quality.. The SYSTRAN Cloud gives you access to the highly accurate Pure Neural Translation Engine, without the complexity and costs of setting up your own server. Our secure enviroment ensures your data is safe, private and protected. Translate your documents directly from your own MS Office applications or upload them. Enjoy a wide range of additional features such as Dictionary tools, API, Side by Side Proofing, Plug-ins for Skype, MemoQ, SDL, Relativity and more. Includes 10 of the most popular language pairs.